We guarantee our direct price is cheaper than Booking.com, Wotif, Expedia & any other website - only if you book direct with us. 4.5 star + beautifully appointed, modern ​2 bedroom apartments​ with loads of space to relax inside & out (huge backyard & separate patios for everyone) at our Hanmer Accommodation. Indulge yourself with our In House Massage at Hanmer Apartments, or go for our Midweek Winter Special in Hanmer Springs. FREE nightly shuttle into town for restaurant bookings. ​Hanmer Apartments, rated best motel in Hanmer Springs. For more guest reviews & feedback click here. by Tripadvisor customers for 2019 (a great result as we were closed for 3 months). 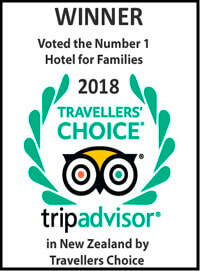 Previously we were voted the number 1 ranked Hotel for family stays in New Zealand by Tripadvisor customers for 2018! Refer to our FAQ (Frequently Asked Questions) for more information on our Hanmer motel accommodation. Web-page titled Hanmer Videos, showcasing the thermal pools, adrenalin activities & golf club. Modern, 2 bedroom, quiet, spacious, apartments.